Let's say for example you have an mp3 file of a music mix and the DJ got overboard with the intro. You love the rest of the mix; if only you can remove the intro then it'll be perfect. Or you need to take only a certain section off an mp3 file. How do you trim the mp3 file? If you already have the free RealPlayer app installed, then you're in luck. It is not very accurate but at least there's a free option! 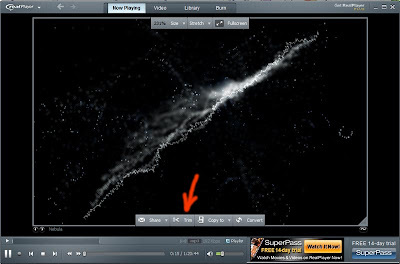 Open the file in RealPlayer. You will most likely have a visualization display going on like mine. Place the mouse pointer over this and you will see a number of options appear at the bottom. Click on "trim" (see screenshot above). The Trim window will appear. You can now close the main RealPlayer window. Play the file and take note of the time where you want to trim off at the start (or at the end). I wanted to trim off the first 5 minutes of my mp3 file, so I start dragging the slider at the left. See the orange slider at the left? The screenshot would not include the mouse pointer, unfortunately, but I was dragging this slider to the 5-minute position. Likewise, you can also drag the slider at the right side to trim the end portion. Not very accurate, like I said, but a better alternative than listening through the intro which I do not like over and over and over every time I play this file. When done, click on the "Save Trim" button at the lower right. Give your new file a name. That's it!